I came to the awareness of juicing gradually, as I became aware of peri-menopausal symptoms and the need to care for my health and nutrition more. I've never believed that nature intended the menopause to be a negative time in a woman's life, any more than that our menstrual cycle is something negative...quite the opposite in fact. Inspired by Leslie Kenton's book 'Passage to Power', I changed from eating meals that consisted of a lot of processed, cooked food to main meals of mainly raw vegetables and fruit, seeds and nuts, sprouting seeds and beans. I added power foods like spirulina and chorella and wheat grass, which I grow myself. I still battle with enjoying beer and wine a bit too much and with my sugar addiction...but I'm making steps in the right direction. Around the time that I began to feel the benefits of the changes I was making, a doula colleague began a juice detox, and I happened to see her with a glass of broccoli, kale and wheat grass juice, and it looked amazing. Before making my changes, I had never been a great one for eating fruit or raw vegetables in any quantity - it seems like a workout in itself to munch through some raw stuff - but I took one look at that glass of green goodness and realized that I was looking at one very fresh, healthy and tempting drink. I asked her about her juicer, and she explained that I needed a masticating rather than a centrifugal machine, and I went online straightaway to research juicing machines. I'm not always bursting with spare cash, and juicers are a very costly investment, but you will need a strong, efficient machine in order to enjoy daily vegetable and fruit juices. I was so determined to get one that my family clubbed together for my birthday and I got a L'Equipe Omni juicer, from the same company that made my dehydrator. I bought mine at UK Juicers At the time I bought my juicer, (2012 or 2013, I can't quite remember...but it's still going strong and gets used a lot ) L'Equipe were planting a tree for every juicer they sold. Almost a year after purchase, a small part of the metal and plastic seive inside the juicer began to bend, and the company replaced it straightaway with no quibbles. UK Juicers also gave me the choice of three different juicing books to choose from, free. I opted for Norman Walker's 'Fresh Vegetable and Fruit Juices'. Jason Vale is a prolific author on the subject of health, and especially on juicing and juice detoxes. His books give me loads of inspiration when I wondering what fruits and vegetables to buy for juicing. Juicers are not to be confused with smoothie makers, which are really no more than a blender with a tap at the bottom. These are great for smashing up soft fruits like pineapple, banana and mango into a pulp and mixing it with yoghurt and other tasty, healthy ingredients to make a lovely nourishing drink.Its great to have a blender or smoothie maker in your kitchen in addition to the juicer, and children love a smoothie when they get in from school. 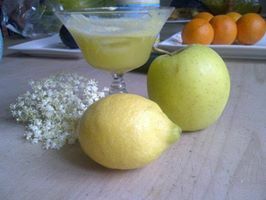 Some of Jason Vale's recipes call for a smoothie maker and juicer, to combine the juice with a soft fruit like a banana or avocado. Smoothies and juices are a great way to get raw goodness into children who might otherwise prefer something a lot less healthy to snack on. I make smoothies for my post natal mums to keep in the fridge for a quick pick-me-up...almond milk, ground almonds, honey bananas are a favourite. The masticating juicer, however, does a really unique job, and it plays a vital role in extracting maximum goodness from your raw foods. Centrifugal juicers have the advantage of being around a quarter of the price, but they work differently and don't make as much juice as a masticating juicer. The masticator turns slowly, so as not to overheat and spoil the liquid, and it is relentless and unforgiving, destroying every fibre in its path. This is the important part, because contained in the vegetable fibres are lots of vitamins and nutrients that we rarely benefit from, simply because cellulose plant fibre is indigestible to humans. Vegetable fibres can pass through the digestive system without ever releasing their locked-up goodness. Way back in human history, our teeth, the original masticating juicers, may have been more efficient at tearing the fibre of the fruit and vegetables in our diet, and extracting the goodness therein. The masticating juicer allows you to experiment with any raw vegetables or fruit you want. I add my home-grown wheat grass. Wheat grass has a very strong flavour which benefits by being a bit diluted in some tasty juice, in my opinion! Familiar foods are suddenly seen in a totally new and exciting light. I remember the first time I juiced a celery stick, along with an inch or so of cucumber, and an apple, skin and pips and all. The colour was enchanting, a beautiful, unique, delicate spring green. The taste, delicate, a little savoury from the celery, was light and alive. 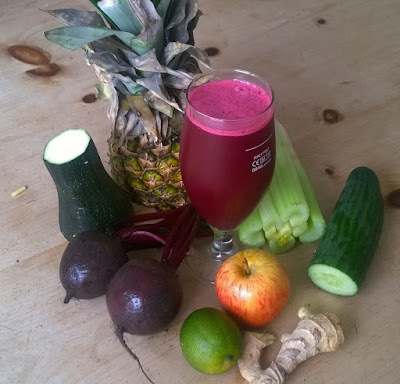 I get immense pleasure from juicing beetroot and enjoying the mad, extroverted pinkest of hot pinks in a glass. Beetroot juice has a silky, substantive quality, it has a thick and earthy flavour, and with the addition of an apple, carrot or an inch of pineapple, and a slice of lime, it makes a juice that’s almost a dessert. The masticating juicer takes the experience and potential of juicing way beyond what I ever imagined it might be. Whatever I’m left with in the fridge, be it an end of cucumber, a head of broccoli, some kale, a pepper, whatever, into the juicer with the addition of an apple and a chunk of lemon or lime with rind on, and you have a refreshing drink, which is as nourishing as a meal. One complaint you do hear about juicers is that they need cleaning after every use. And this is very true. When I’m on a three-day detoxification, I will juice four times a day, and yes, I clean the juicer after each use. You just don’t want to leave the machine’s interior filters covered in pulp; it’s sweet, moist and full of the sort of goodness that bacteria love to munch on. I love my juicing so much that I’ve even learned to love the washing up! Seriously, we have become so used to instant gratification in this day and age that we want the reward without being prepared to do even a few minutes of menial work. There is a goodness in caring for the things that serve us, and its possible to learn to actually relish the little rituals that surround the preparation of food. My first move, when I’m about to prepare a juice, is to fill my sink with warm soapy water, and I dismantle and soak the mechanism before I take the first sip from my glass. It’s not complicated at all, there are only four parts and I give thanks to them as I clean them. My stomach juices are then getting ready to digest the juice, which is good, because you don’t have to actually chew it, which is one of the normal stimulants for gastric juice production.Its quite important to consciously remember to give a little chewing action and hold the juice in your mouth, for this very reason. Most cool liquids are swallowed really fast, so its good to be mindful with your juice, and use it as a chance for a little time out to be thankful, and revel in the feeling that this beautiful, live plant essence is bringing you the gift of nourishment and supporting weight-loss.